Hedy Lammar, born Hedwig Eva Maria Kiesler in Austria, was considered by many as the most beautiful woman in the world, starring in countless films. Hedy grew up in Vienna and married millionaire Friz Mandl, an arms dealer and Nazi sympathizer. She shot to fame, aged just 18, with a bathing scene, which was at that time considered scandalous, in the 1933 Austrian art film “Ecstacy”. Having grown to hate the Nazis as well as her husband she ran way and met Holywood mogul Loius B Mayer. His studio cast her in glamorous parts alongside popular leading men, and promoted her as the “world’s most beautiful woman.” She starred alongside Clark Gable, Spencer Tracy, Judy Garland, and appeared in some 25 films during her film career. The technology wasn’t really used during WWII and while it was used on naval ships during the Cuban Missile Crisis the enormous significance of their invention only became clear many years later. Now known as “spread spectrum” technology the invention forms the technical backbone that makes mobile phones, fax machines and WiFi possible. Hedy Lamarr received very little recognition for her invention at the time. Although patented, she and her co-inventor generously gave the idea free to the US Military during WW2, but they told her to go back to raising war bonds! For her contribution to the motion picture industry, Hedy Lamarr has a star on the Hollywood Walk of Fame and has begun to receive greater recognition for her inventions. In 1997, she and George Anthiel were honored with the Electronic Frontier Foundation (EFF) Pioneer Award and later in the same year, she became the first female recipient of the BULBIE™ Gnass Spirit of Achievement Award. Here’s a video about Hedy’s remarkable achievement. 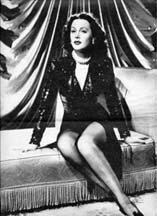 Information Pioneers: Hedy Lamarr from Information Pioneers on Vimeo.